The Sales Gap Between The Tech And The Company. Every service company wants that perfect employee. The employee who can ethically sell a ketchup popsicle to a person wearing white gloves. This employee can also do everything under the sun, drug free, smells good, good looking, can diagnose problems better than you, who won’t leave the customer hanging and will be best friends with them by the end of the day. If you have an employee like this I hope you pay them VERY well, because they are far and very few between. It borders fantasy land. So let's come back down from fantasy land and deal with reality now. Your new employee has passed the drug test. He has a clean drivers license, he passed your little 20 question service repair quiz and is 20 years old, AND this kid has a great attitude. He’s ambitious and ready to rock and roll! Tell me what kind of experience a 20 year old has? Reality….this is what you're getting - Cheap labor with a positive attitude. He has no experience selling, let alone knowing anything about the trade. So we have a dilema. Cheap labor, can use pliers and has no selling experience. So you’ll drive with him, show him the ropes and he will eventually get the hang of it. Right? What is this kids motivation? What is anyone's motivation! You guessed it….MONEY! What is any employees motivation?? It’s money people! We have a tech with no experience and can barely do his job. Now, ask you employee how he would like to get paid. Work 30 hours and get paid for 40 or work 40 hours and get paid for 30? You introduce him to your flat rate price book. You (as the business owner) have already set the prices. You have included in each price what it would take to do each job. 15 to 20 minutes of travel time and 10 minutes to write up the invoice plus the time it will take to do the job without rushing. 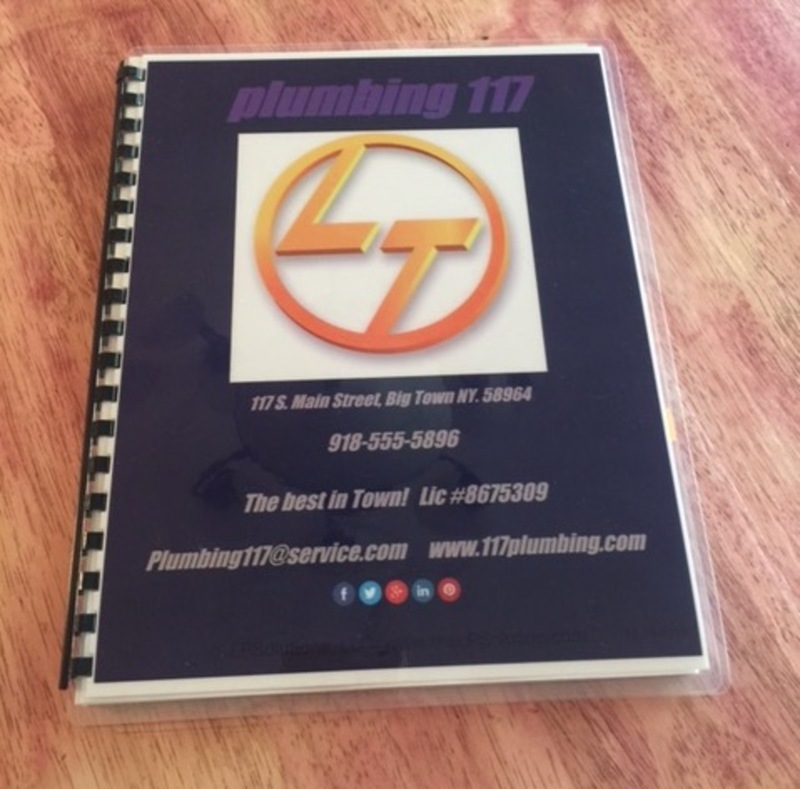 So as an example, a faucet removal and installation with new supply lines ends up calculating to a time of 2 ½ hours based on your estimates. This employee knows he can do it in less time and knows he will get paid for 2 ½ hours no matter what. In the employee's mind he’s thinking bonus pay. He’s thinking I can thoroughly get this done in 1 ½ hours, slam dunk, and get an extra hour of pay. Who in their right mind would milk a job when they can get it done in less time and get paid more money! Do you know why? Because you are not paying them by the hour. You are paying them by the minute. Rule #1. “You hire an employee for their attitude. You can always teach skills later”. Simon Sinek. You now have a motivated employee, you have incentives, your employee is happy to work, your employee can’t wait to show up for work and employees are glad to put door hangers on neighbors doors with their name on it because they will get those jobs. HOLY COW! A $50 bonus or a $20 gift card for selling a $225 service contract that they didn’t even have to convince the customer to buy because all they did was put the price book in front of the customer and let the customer make the decision, AND IT’S AN EXISTING CUSTOMER THEY SOLD IT TO! Rule #2. You need a flat rate price book to present to the customer. You need to show transparency, peace of mind and professionalism to the customer. Too many companies don’t take the time with customers and take their thoughts into consideration. Service companies can be like cavemen! ~Grunt~, me work, you pay, me don’t care about clean or good job! Why are you in business? Who gets a call, rushes to the job, gets it done as fast as possible, collects the money and runs?? Did you sell them a juicy service contract, free home inspection, build a relationship with them, put door hangers on all the houses around the house you serviced? You go ahead and let the service companies that want to please property management companies with volume work at discounted prices who are swamped with work do that back breaking work. Rule #3 Invest in our employees. That means sales seminars. Don’t waste your time with seminars for learning their trade . That is something they will pick up in time. You need good sales people. Even your secretary or office manager needs to be trained properly for what they do. I would rather have employees excited to show up for work than show up late because the company has not incentive or reason to come to work except get paid for the work they do. Rule #4. There is a big difference being ethical and scamming or ripping off people. If you're going to promise the world to the people you sell a service contract to, you best follow through with what you have promised. The biggest disservice you can do to your community is to promise one thing and deliver nothing. Make sure you always have copies of whatever you sell them, e.g., service contracts, warranties, guarantees’ etc. Make sure that your customers have options in their pricing. ALWAYS, ALWAYS, ALWAYS get the customer's signature on all contracts and invoices. Last rule. When your tech writes up an invoice there must be great detail. Writing up an invoice saying, “Installed faucet” for a $528.86" leaves you wide open for frivilous lawsuit. You tech needs to write down everything they did to justify the time and what they did on the job. Example: “Showed customer existing crack in sink before installation. Customer wanted me to put in a new faucet that they purchased. No warranty on the faucet. Only warranty on our end will apply will be if the faucet becomes loose on the deck. Put new faucet in hallway bath. Removed old faucet. Explained to the customer that the flex lines were bad and needed to be replaced. She agreed. Left all the paperwork for faucet with customer. Customer chose to keep old faucet. Cleaned up after installation. Customer approved of cleaned area and that faucet worked properly and looked good. Customer paid with check # 3746 for $528.86”. This customer has nothing against you with an invoice written like that. Make sure they sign the invoice! Hire for attitude, sales train your employees and have a flat rate price book to present to the customer. Fill that gap between the employee and the company where nothing happens but awkwardness. Reduce your liability with lengthy explanations and always live up to what you promised to the customer, because that can also leave you wide open for a lawsuit for scamming people. Become an icon and professional leader within your community. 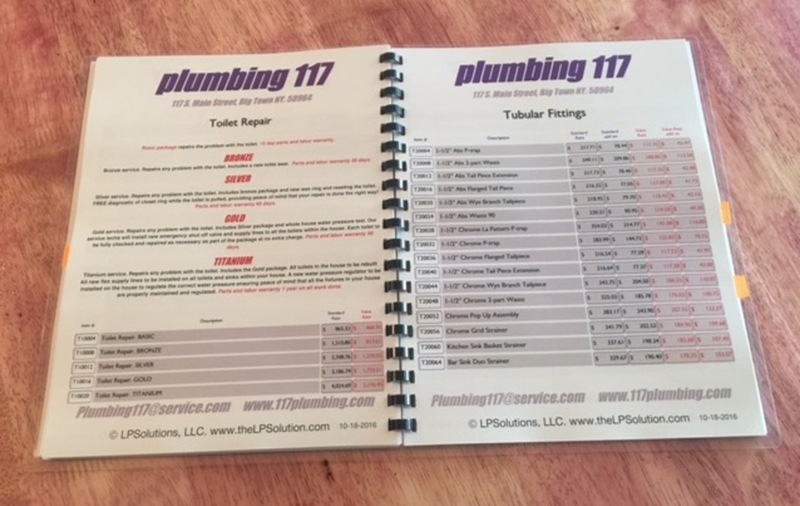 To find more information on flat rate price books for any type of service company, go to www.theLPSolution.com and get yours today!